was designed by a photographer for photographers. The BLACKJACKET™ is a revolutionary focusing cloth made of a light-resistant fabric whose construction resembles a pull-over tunic. The NEW "collar" or "neck" of all BLACKJACKET™ focusing cloths attach to a view camera by way of a double adjustable elastic cord that permits customizing the collar to fit different sized camera bodies. Five models: Digital SLR, 4x5/5x7 and 8x10. Ultra Large Format designs by custom order. Once the BLACKJACKET™ focusing cloth is attached to the camera, the photographer inserts his/her head into cavity created by its trunk. 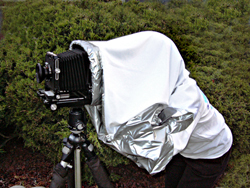 With the trunk of the "jacket" draped over the head and shoulders of the photographer, this innovative dark cloth blocks out stray light providing an ideal, darkened environment in which to view the ground glass of a large format camera. This creative solution goes far beyond previous concepts by employing "sleeves" which provide an easy means for the photographer to insert his/her hands into the darkened environment to access camera controls and/or check focus, and still maintain total darkness. Now Even Better!Introducing the HYBRID SHADOW! As of January, 2018, we have ceased construction of our best selling, standard HYBRID in favor a new version. The innovative design remains the same in the new design, but, with the exception of the neck, the HYBRID SHADOW is constructed entirely of soft, supple, woven, water-resistant, breathable fabric. Surprisingly, the HYBRID SHADOW is not only more comfortable to use, it weighs two ounces less than its predecessor. All BLACKJACKET™ focusing cloths ship with the BLACKBAG™ which does double-duty, serving as an attractive storage sack when the BLACKJACKET™ is not in use, and more importantly as a solution to the most challenging light leak--caused by the gap beneath the rear standard and base plate of field cameras (or the two gaps beneath rear standard and either side of the rail of monorail cameras). Click here for a close look at this new feature. Early customers seeking to modify older focusing cloths to use the BLACKBAG™ feature can obtain directions here. For more detailed information or to see for yourself how it works, click the FAQ, DEMO (slide show) or VIDEO (youtube) links. Now, we've made it even better! model and just as dark! 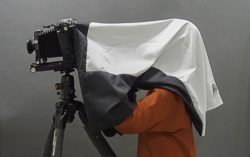 Whether you choose the ORIGINAL or HYBRID style, the 4x5/7 BLACKJACKET™ or the Digital SLR BLACKJACKET™, each cost $80 (US), while the 8x10 BLACKJACKET™ is $95 (US). New, Ultra Large Format models are also available in 72", 84" and 105" sizes and can be customized as needed. Most shipping is via USPS Priority Mail which reaches its destination in the US in 3 days. We also offer alternative shipping methods to meet your needs. We gladly accept cashiers checks and money orders, or you may pay with your credit card via PAYPAL. To purchase your own BLACKJACKET™, click the BUY link. WHERE CAN I GET A BLACKJACKET™ FOCUSING CLOTH? You are at the source. 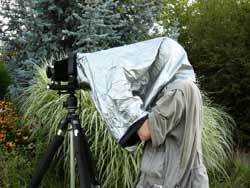 QuietWorks Photography is the exclusive distributor for the BLACKJACKET™. Copyright © 2003-2016 QuietWorks Photography LLC. All rights reserved.